I have begun a new journey. Last summer I accepted a position at The Potter’s House. This incredible opportunity affords me the ability to continue writing and taking photographs for marketing collateral and social media for their organization. As you might imagine, this is a game changer for our family. If you are interested in getting your photos done, please note that I might need to say no. It’s nothing personal, only I am protecting my family from my constant absence. What I will likely do is take your name, pick a great location, set some dates, and try to get sessions set up back-to-back. I know that isn’t quite as nice as the flexibility I had in the past, but it’s what works for us right now. 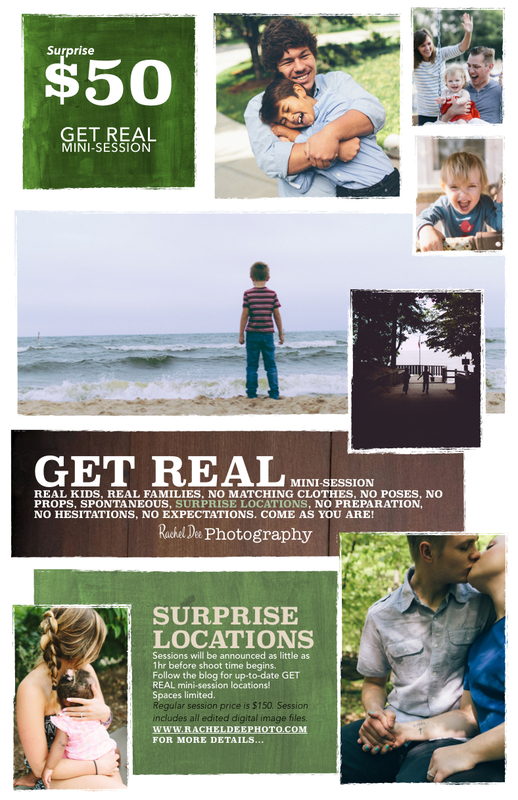 When time allows, I would like to start the $50 Get-Real Mini-Sessions. I would love to get one done as early as Fall/Winter 2016, so if anyone is interested, be sure to follow the blog so that you will be notified immediately once one gets scheduled. Thank you all for understanding! Includes electronic download of all edited images from shoot which are then available to download from racheldeephoto.instaproofs.com. Coverage requests can be sent and I will take a look at the date/location/venue to determine whether it is a fit for both the couple and myself. *Range from $800-$2000. Typical wedding/Engagement Package is $1500. Events, Field trips, Business and Marketing needs. Includes an electronic download of all edited images from the shoot. *For Weddings and destination photography, please fill out the contact sheet to request a quote especially for you! hey Rach, wasn’t sure how to contact you now that your off of fb. I would be super interested in a family session this summer. Not sure when you plan to be down here next or if I can convince Ryan to come up there. There isn’t anyone else I would want to do our family photos!!!! You have such a God given talent!!!! I would love to shadow you some day too!!!!! Look forward to hearing from you!!! Strolling the streets before our flight home. March 27. A trench coat wearing, unidentifiable germ exposed himself to our family this week. The aftermath was Kleenex carnage and hours upon hours of lost productivity. I lay in bed agonizing over dishes in the sink and toys left out. Two out of three will miss school tomorrow as the wreckage continues. I left the country in March, and for a myriad of reasons, our car sat at Mom’s. This afternoon we reclaimed the car and mushed in a couple of semi-quarantined outdoor hours as a way to say, “We’ve had enough!” We watched the lake change hue, a dark line forming on the horizon as the rain drew near - whooshing us back to the place we had only just left. There IS a blue-green peace to this pace, but due to the reclusive nature and interrupted sleep, not one I care to embrace often. Three cheers for timid waters that didn’t seem to mind our viral visit. Outside Canadian Dave’s, dusk upon us, and Massaman in our bellies. They sing and pray before they eat, they take their shoes off before entering anywhere (my husband applauds such efforts), they take impeccable care of what they have (washing their own clothes, keeping sleeping mats rolled up, dorms tidy), and they have time to see each other. It’s a better way, and I’m forever inspired. Life in Mae La 2.